Every year on St. Patrick's Day, the world around us suddenly looks a little ... jealous. It's not just Kermit the Frog or the Incredible Hulk or that guy in your office with the green necktie. 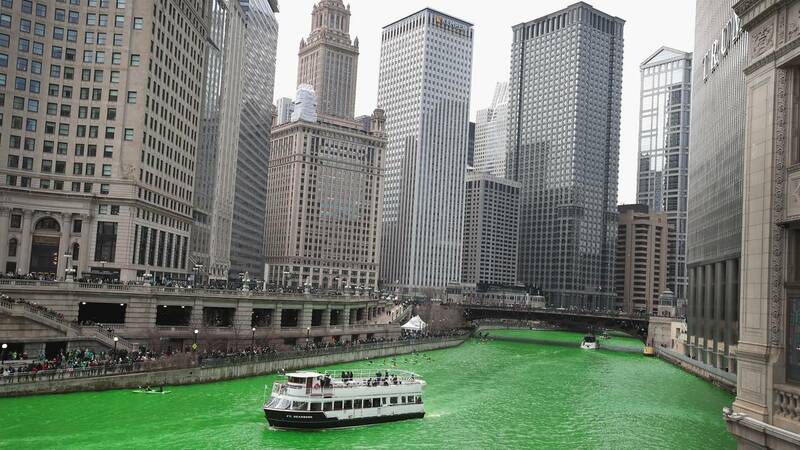 It's green food, green parades, green fountains and famous sites around the world that take on a greenish glow. There are numerous theories as to why green became the color of the holiday. It is one of the colors on the Irish flag. Green also is the color of a shamrock, a symbol of Ireland -- known as the Emerald Isle because of its lush vegetation. And traditional Irish legend held that wearing green made you invisible to leprechauns. Regardless of the reason, the world unites around the color green on St. Patrick's Day. Here are some of the most notable green landmarks. Rome's 2,000-year-old stadium takes on a green look. And of course, green is the dominant color in March 17 parades around the world. Here, members of the County Carlow Association ride horses past St. Patrick's Cathedral on 5th Avenue in New York. The city's St. Patrick's Day parade, dating back to 1762, is often called the world's largest.